The STMicroelectronics STM32F207IG microcontroller (IC1) is provided with the MCBSTM32F200 board, and the STMicroelectronics STM32F407IG microcontroller (IC1) with the MCBSTM32F400 board. 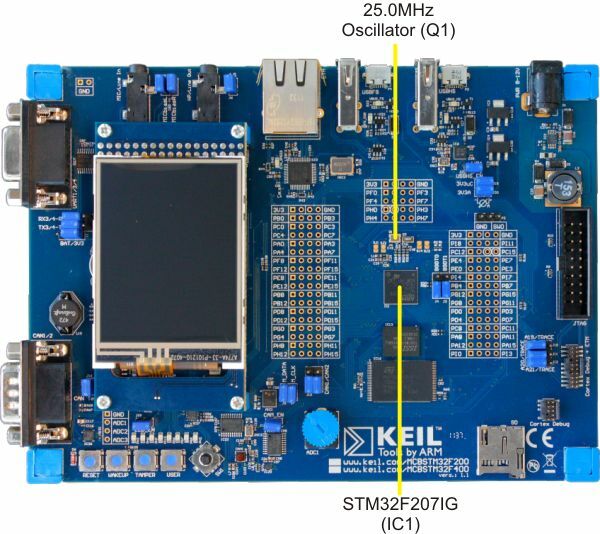 Both are high-end STM32F devices with on-chip CAN, Ethernet, USB (full and high-speed) connectivity and parallel camera interface. A 25.0 MHz oscillator (Q1) provides the clock signal for the MCU.